Every time I wear this necklace, I get compliments, which cause me to turn into a super craft nerd and exclaim I made it myself! I was invited to a bead trunk show and told the attendant I’d like to make a pendant necklace and to steer me toward all the supplies I would need. It was my first attempt at necklace making and two years later it hasn’t fallen apart. That’s a good thing. I needed wire, crimp beads, clasp, pendant, beads and the ability to evenly string on the beads to a length that wouldn’t choke me or feel too heavy when wearing. 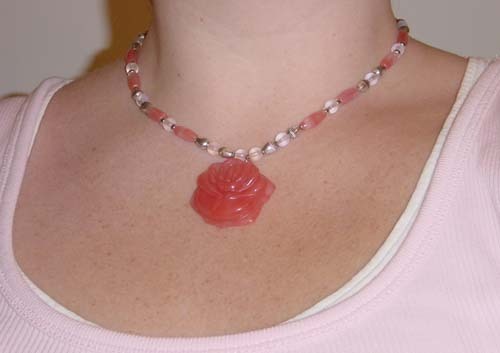 I’m not a jeweler, but I think necklaces are easier to make than bracelets, because the piece can be a little longer or shorter without having a negative effect. A too short or too long bracelet can be troublesome for thin or larger wrists. If you have never made any jewelry, but would like to, I would say start with a necklace (and then share a photo of it with me)! do you ever use real stones for your jewelry? what do you do with all your crafts? do you give them away to friends and family?